FOR more than a decade, governments have begun to react and plan for a much older population. In Scotland, the number of people aged over 75 is estimated to rise by 79 per cent over the next 25 years. One of the results of this is that the number of people with complex care needs, those suffering from conditions such as Alzheimer’s and dementia, is rising, with Alzheimer Scotland estimating more than 90,000 people in Scotland were suffering from dementia in 2017. The confluence of these two demographic shifts has huge implications for government policy in areas such as taxation, health, welfare and, of course, housing. It is clear Scotland is already facing a housing crisis, particularly in cities such as Glasgow and Edinburgh but the same is also true in more rural areas where it is not just a matter of the number of houses but their design as well. In many of those rural areas there is a high demand for not only social housing but social housing which provides an element of care for the kind of long-term conditions that are on the rise. Most often this is provided by housing associations such as Hanover Scotland. For example, we have recently completed two new developments in Moray, at Varis Court in Forres and Linkwood View in Elgin, in partnership with the Moray Integrated Joint Board (IJB) Moray Health and Social Care Partnership and Moray Council. 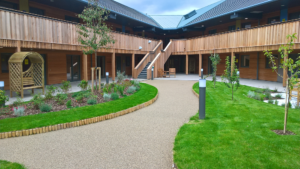 Both have been custom-built to help care for residents with conditions such as dementia. They feature services such as a specially outfitted sensory room and have corridors and lifts large enough for hospital beds. Varis Court also has a ground-breaking Augmented Care Unit (ACU) operated by the NHS which contains flats that can be used as an alternative to hospital admission, or as a bridge when a patient is able to leave hospital but their care package is not yet in place to allow them to return to their own homes. Obviously, developments such as these are substantially more expensive to construct and service than our other social housing and because of this we are restricted in the number that can be constructed under the present grant regime. But they are the kind of homes we may have to build more of in the future. The issue we face is that the funding available to build these homes – from the Scottish Government’s Affordable Housing Supply Programme – does not distinguish between different types of affordable housing and applies only generally to “social housing”. This is a situation where housing associations and others build significant amounts of general needs housing, a good thing, but there are not enough specialist homes for older people. What is needed is consideration, within each council’s local housing strategy, with support and guidance from the Scottish Government and in partnership with the local Integrated Joint Board (IJB) of the long-term need for housing that can deliver complex care needs. This truly joined-up approach would take account of the location of housing and its cost. Critically, it should include not only a development’s enhanced design and services it is equipped to provide but also the capital required to fund these enhancements, including grant allocation which requires to be reviewed and increased to reflect the higher specification. Empowering IJBs to enter into long-term partnerships with housing associations to plan, adequately fund with an appropriate revenue stream and deliver integrated care over extended periods is essential to provide the stability and continuity that will benefit commissioners, providers and, most importantly, residents. This approach will result in the most efficient and cost-effective use of resources and allow a closer fit with national policy.